Bachelor of Science in Psychology, Master of Science in Rehabilitation Counseling, Certified Rehabilitation Counselor. 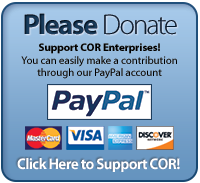 COR Enterprises' Chief Executive Officer since 2004, Tony began working with COR in 1995 as a Placement Specialist and went on to become COR's Rehabilitation Director. Previously, he worked at Rimrock Foundation, the Mental Health Center and Saint Vincent Healthcare. He is a former president of the Montana Association for Rehabilitation and a past board member of the Brain Injury Association of Montana. He was also an adjunct faculty member at Montana State University-Billings in the university's Human Services and Rehabilitation Department during the 2004-2005 academic year. Bachelor of Science in Psychology. DDCPT certified. Leigh Ann began working with COR in 1983, and was promoted to Operations Director in 1989 and Vocational Director in 1993. She has oversight of all services within the Developmental Disabilities Program and serves as liaison for DD case management. Responsible for Department of Labor compliance, she oversees several divisions of production, including all federal contracts under the NISH program. She also serves as COR's Quality Assurance Officer. Bachelor of Science in Rehabilitation and Related Services. Jennifer joined COR Enterprises in 2007 as an Employment Specialist and became Vocational Evaluator in 2012. She became COR's Rehabilitation Services Director in 2015. Jennifer has many years of experience serving individuals with disabilities through local group homes and non-profit recreational programs. She also has been an active member of the Montana Association for Rehabilitation. Bachelor of Arts in Sociology Jodi became COR's Staff Development Director in early 2012. She began her employment with COR in November of 2008. She has worked in Document Management Services and in Supported Living at COR. Jodi has worked with people with disabilities since 1997. Bachelor of Science in Rehabilitation & Related Services Dani began her employment with COR in 2000 as an Employment Specialist for Career Guidance Center. She returned to COR in August 2009 and worked as the Assistant Director of Supported Living. Previously, she worked for the Mental Health Center and the State of Montana. Dani became the Director of Supported Living in January 2012. Christine Niemi started with COR in 2010 as a Supported Living Specialist. After working as an Employment Specialist and then Assistant Supported Living Director she became Day Program Manager in 2018. Chris has many years of experience working as a Direct Care Staff and Supervisor in the Human Service Field. Bachelor of Science in Business Administration Linda Vanberg has been the Business Manager for COR Enterprises since July of 2009. Linda has worked for COR since July 2003 – her duties have included payroll, accounts receivable, program and production billing. Linda is the proud mother of four and grandmother of three. 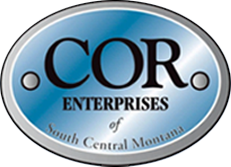 The COR Enterprises Board of Directors is composed of up to fifteen members from Billings and surrounding communities who donate their time to establish policies, approve COR’s operating budget and oversee management of the company.